Fall Leaves originally uploaded by DGMiller777. Last week over dinner in Dalton, GA, Paul Friederichsen and I got into a discussion about carpet myths. You know, bad advice from folks in positions of authority - like doctors and editors. We exchanged personal stories. In my case, the pediatrician told us to rip out all of the wall-to-wall carpet in our house to alleviate my daughter's allergies. I knew this information to be wrong from having written Carpet Alleviates Allergies [and contributed Is carpet worse for people with allergies? to ExpertVillage a few years ago]. Yet, too often this misinformation is taken seriously because of whose mouth it comes from. Paul expressed so much passion for the topic that I invited him to write a post for The Carpetology Blog. A few days ago, I was reading my September 17 edition of the Atlanta Journal-Constitution and came across an article entitled “Autumn Allergens” in the Living section of the paper. Written by Helena Oliviero (holiviero@ajc.com) the piece was impressively done with graphics, microscopic photos of mold spores and various statistics. At the end of the article, she provided advice apparently compiled by another writer (Howard Pousner, hpousner@ajc.com). This portion of the article contained a common mistaken belief about carpet. Under the subtitle “Allergen War Indoors Aids In Fight Outdoors,” among the suggestions listed for controlling allergens indoors was to “remove carpets and drapes (or wash the latter frequently in hot water)”. This is what the Carpet and Rug Institute (located just 70 miles up the road from the AJC in Dalton, GA, the carpet capital of the world) calls an urban myth. And it’s not just any harmless or amusing urban myth that circulates on the Internet. This one has people who are suffering from allergies or asthma (or concerned that they will) ripping up their carpet and replacing flooring at the cost of hundreds or thousands of dollars … for no substantial health benefit. And yet, here it is, passed along as legitimate advice from a respected news media source. Sad. Had the writers bothered to research this extreme measure they are advocating, they might have tempered their advice, left it out altogether or even addressed it by presenting the other side of the argument. That side is that carpeting, when properly cleaned and maintained, actually helps trap allergens from the air by natural gravity and hold them until vacuumed away. Conversely, non-carpeted surfaces, such as hard wood, laminate or ceramic floors can actually aggravate conditions because there is nothing to trap and hold the allergen particles. Simply walking through a non-carpeted room will stir-up the allergen-filled dust particulate into the air – and into your eyes, nose and throat. The key, of course, is correct installation, maintenance and cleaning of carpet. Every manufacturer of carpet gives specific instructions on how these things should be done for their products. If carpet is installed in areas prone to be damp, if spills are not properly taken care of and if carpet isn’t vacuumed regularly and cleaned by a professional once or so a year, then it likely won’t perform as it should and problems may occur. Carpet makers insist, however, that if the owner treats his or her carpet well, the carpet will treat them well. After all, no other floor covering provides the warmth, comfort, quiet and cushion of carpet. The myth that carpet contributes to allergy and asthma problems has been perpetuated by many in the medical community and passed along by well-meaning writers and editors because of this. And unfortunately, many people looking for relief to their symptoms are only too eager to remove perfectly good carpet from their homes. Before resorting to such an extreme and unproductive measure, get all the facts. The Carpet and Rug Institute’s Website is loaded with good information and research studies on this subject. Go to www.carpet-health.org/aa.asp. I first heard of Paul from his marketing commentary on TalkFloor.com [in fact, you might listen to his recent series of interviews on TalkFloor about the importance of branding], and then got to meet him in person because we both serve on the Surfaces Education Advisory Council. He is president of BrandBiz, Inc., a marketing communications company located in Atlanta, Georgia, where he interacts with flooring and non-flooring organizations. Paul can be reached at paul [at] brandbizinc [dot] com. As Paul recommends in his article, beware of carpet misinformation! Beware of extreme recommendations from those in positions of authority. Do your research first and you may be surprised to learn that carpet does not contribute to allergies. Instead, it alleviates them! Our 2008 Color Forecast, Color Folio 2008 - A Field Guide to Color - includes two parts. One is the Color Around The World series, offering a taste of the culture of color, which we've just completed. The other is inspired by John J. Audubon's work. I thought it would be helpful to recap all of the elements of Color Folio 2008 here, for easy reference. After all, one color may have multiple associations depending on its use in a particular country and culture. As an example, white is a symbol of purity and innocence in the U.S., and of mourning in some African countries. Each color family is examined for cultural associations enriching the specifier’s understanding of color application in today’s diverse business environment. 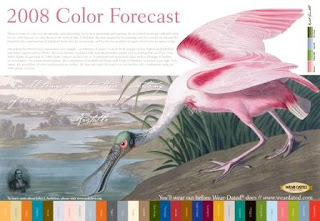 In Color Folio 2008 - A Field Guide To Color [in Flooring The Consumer], we include information relating to the Audubon-inspired part of the forecast, as well as some color trends. You see, John J. Audubon's paintings inspired us. Especially when we discovered how relevant the beautiful color combinations of Audubon’s birds were for our forecast, and for the way in which we apply color to interior spaces today. Did you know that Audubon produced more than 450 plates of beautiful birds? For many at the time, Audubon’s paintings were the first glimpse of the wild. One French art critic recalled his works and said they brought to Europe a fresh poetic vision of America in all its wild abundance! 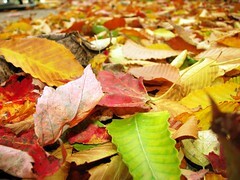 Nature offers a spectacular vision of color with countless nuances and shades of every hue. This Audubon inspired vision of nature with its intriguing color combinations is relevant today and it inspired our 2008 palette which is a bit more conservative and slightly more complex than in previous years. You can view a video clip that shows Audubon's birds in conjunction with color trends from the Wear-Dated website. Read how you can apply some of these trends in Color and The Retail Experience. If you'd like to learn more about John J. Audubon, here is a 2008 Color Folio Resource List we developed. This episode of A Foot's Perspective captures trend highlights from a show that Ann Hurley has just returned from, Maison & Objet, the premier home textiles and interior design show that takes place twice a year in Paris. It's a huge show occupying 7 halls. It captures trends from all over the world. These are important trends as they influence carpet, flooring and interior design style options in our marketplace. I caught up with Ann last week in our Kennesaw, GA office and asked her to talk about the trends she observed. Grey is everywhere. But, this grey story is about tints of grey with the color being as easily violet cast as green cast. Neutrals and browns are also tinted and cast with suggestions of other colors. Against these neutrals you see bright accent colors. Woods are white-washed, rustic, hand scraped, weathered and greyed. You can hear Ann describe these trends in A Foot's Perspective - Episode 13. + The official Maison & Objet website lists 2009 influences offers a 3-step itinerary focused on Simplicity: Farmlife/Back to solid ground, les Metropuritains/Get in line for eco-survival, Slow tech/Less speed for better living. For the most recent episode, visit A Foot's Perspective - Episode 12. Or you can scroll through previous blogposts with links to all previous episodes of A Foot's Perspective. 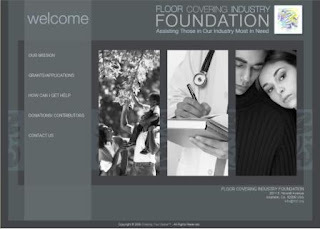 Were you aware that there exists an organization called the Floor Covering Industry Foundation [or FCIF for short]? I mention it because a major fund raiser takes place this Thursday, September 25 in the Atlanta, GA area. The Floor Covering Industry Foundation is dedicated to financially assisting those who are or have been affiliated with the floor covering industry who experience catastrophic illnesses, severe disabilities, or other life-altering hardships. Anyone employed in the floor covering business for at least five years can apply. Grants are offered based on two criteria: catastrophic illnesses/injury and financial need. Real people, with real problems that the FCIF tries to alleviate. Carpet and The Carpetology Blog Are On a Roll! Apparently, word has gotten out that we know a little something about carpet here at The Carpetology Blog. Recently, Nancy Jones-Bonbrest, a reporter for the Baltimore Sun, contacted our very own Christine Whittemore for her expert opinion on today's carpet trends. Nancy's article, titled "On a Roll," appeared in Saturday's Sun and offered a very positive look at the role carpet can play in the home. You can read the full article here. "Many homeowners are turning to carpet for a variety of reasons," Jones-Bonbrest writes. "Some are using carpet to make a statement of style. Others [...] are finding carpet a good companion to hardwood, stone or tile. And others simply can't resist the feel of it under their feet.Whatever the reason, there are many new options to choose from." And of course, much to our excitement, there's more interest in color beyond beige! We're so honored to be included in Nancy Jones-Bonbrest's article. Here's to beautiful carpet! Have you caught the Bud Light commercial where carpet is the star? And, then, did you know that Budweiser celebrates carpet installers with Bud Light® Real Men of Genius Mr Next Day Carpet Installer? I'm happy to inform you that you can catch both here at The Carpetology Blog! Subscribers, please click on this link to view the Bud Lite commercial on YouTube. Subscribers, please click on this link to view Bud Light® Real Men of Genius Mr Next Day Carpet Installer radio commercial. Note the tagline for this real man of genius: "if you're a payin', I'm a layin'!" Please Vote For Us! Vote For Carpet! Would you vote for us? In the Forrester Groundswell Awards? You see, we've submitted an entry for The Carpetology Blog [see My Forrester Groundswell Awards Submission] -- which is about all things carpet -- and we are really excited about it. Because we are passionate about carpet and The Carpetology Blog. And also because of your wonderful support. Your support added impetus for submitting an entry. Thanks to you, our traffic has grown and we are thrilled to pieces about it. Here's the press release announcing that Wear-Dated®’s The Carpetology Blog Enters Forrester 2008 Groundswell Awards. When we first submitted our entry, we were one of three in the Talking Category as you can see from this screen shot where The Carpetology Blog is the entry in the middle with Acuvue Wink and Johnson & Johnson health channel [YouTube]. The deadline for entries has passed and the count in our category is now up to 31, with competing entries ranging from Sears, Pentel, Rubbermaid, GM, The Wall Street Journal and many others. We are in amazing company. You should definitely check out all of the entries in the Forrester Groundswell Awards: Talking category. And when you are there, please do scroll to the bottom of the page and read our entry [we are second from the bottom]. Or go directly to The Carpetology Blog entry and add your comment to the process. Go ahead and share your thoughts about what we do here at The Carpetology Blog. Let the world know. We intend to post all of the comments here to say thanks. You have until October 28th, 2008. That's when Forrester will announce the results at the October 28 and 29 Forrester Consumer Forum, and when comments will be shut down. So, please, will you visit and add your review? Feel free to let others know so they can add their voice, too. The last color in our series about Color Around The World is Black. The series comes courtesy of Ann Hurley, Woman of Wear-Dated and Ultron carpet fiber color expert, who lives and breathes color and product trends. Interestingly, black has had very similar meanings throughout history and across different cultural boundaries. Black is actually the absence of light or the absence of the transmission of light. Black is the color of night – Death and mourning have long been associated with black in multiple cultures and in most, it’s associated with the mysterious and the unknown. Black has been a classic fashion color since the 1500s, associated with sophisticated and classic attire, as well as the attire worn by those with positions of authority! Judges, priests, designers and the formally dressed (robes and tuxedos) have worn black for centuries. Black ink originated around 2500BC in both China and Egypt. It was made from the carbon residue of burnt twigs mixed with water and a gum like substance extracted from trees similar to our pine trees. In Japanese culture, kuro (black) is a symbol of nobility, age, and experience, in contrast to shiro (white), which symbolizes serfdom, youth, and innocence. The highest rank of many martial arts is the Black Belt – symbolic of true achievement, understanding and wisdom - a blending of oneself, and the universe. M 1 KAB originally uploaded by kcm76. 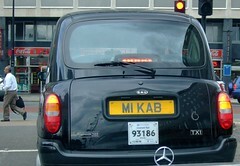 In the United Kingdom, “black cabs” are recognizable the world over. Today they are more colorful with brand advertising, but are still considered a British tradition. The traditional Venetian rowing boat, gondola, was for centuries the chief means of transportation within Venice and still have a role today, serving as traghètti [pronounced like spaghetti] or ferries. A moral law of Venice required that gondolas be painted black to eliminate class differences - they are customarily still painted black today. The symbol (Yin-Yang) represents the ancient Chinese understanding of how the forces of nature work together. The outer circle represents "everything", while the black and white shapes within the circle represent the interaction of both energies. Good Luck originally uploaded by xrrr. Jet Black jewelry fashioned from fossilized wood was popular during Victorian times and worn during a time of mourning. 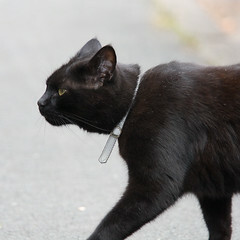 A black cat crossing your path is considered bad luck in many cultures. In what country is it considered good luck to spot a black cat? This episode of A Foot's Perspective takes place in my Mom's dining room in Washington, DC, which features two different carpet styles. She has taken a patterned carpet and inserted it within a textured carpet border. The effect is wonderful! What my Mom created is something that Thom Filicia suggests in Thom Filicia's Design Inspiration Tips [although the solid texture style is not what my Mom has used in the rest of the house] and Vickie Gilstrap in The Latest in Carpet Style Trends. This photo to the left shows you the diagonal trellis pattern and the solid textured border she chose. Isn't is fantastic? What a way to create your own statement of style! For the most recent episode from A Foot's Perspective - Episode 11. Or you can scroll through previous blogposts with links to all previous episodes of A Foot's Perspective. In Pray Tell: What is a Frieze Carpet?, I exposed you to friezes, getting up-close-and-personal with this carpet style. I've recently heard about a modified frieze category called 'tailored frieze' that is making its way into stores and generating great reactions. According to Rick Jose, our regional manager in Middle America, retailers describe this carpet style as a hybrid style. Some call it a 'casual texture.' Essentially, they consider it a style that is in between a texture and a frieze with a nice soft hand and tight twist. That combination captures comfort & fashion at a great apparent value both visually and when you touch the carpet. An example of this hybrid tailored frieze style is Palm Vista [yes, it's made with Wear-Dated DuraSoft carpet fiber] from Wunda Weve. According to Wanda Amann, our Wear-Dated Representative in Salt Lake City, Utah [who graciously helped with these photos], the casual texture or tailored frieze style that Palm Vista epitomizes is a winner of a carpet style! She says it captures a carpet style look that is selling right now; it's a very soft style. It looks and feels expensive, yet represents great value at retail. In this photo, you see Palm Vista's color line. The 24 colors look sophisticated and rich. Look for Palm Vista at carpet retailers around the county that carry Wunda Weve products. And, then, let me know what you think. All three are inspired by nature in a way that "captures the interplay between the elements and the wonder and drama Mother Nature creates on a daily basis" per the press release. Ann asked Laura to talk more about the collection and its inspiration. According to Laura, the intent for the collection was to create visual textures that still read at a distance. She wanted to emphasize the distinctions of nature -not only its variations but also its imperfections [e.g., the effects of time and pressure on slate, tumbled stones, and the natural patina of rain on steel...]. To make this intent reality, she incorporated novelty yarns with specialty textures. In many ways, she took an approach more similar to what is seen in fashion apparel than traditionally in floor covering. Not only did she work with novelty & specialty textures, but also with luster & dye levels that create subtle reflections & colorations. Ann's take on this: by combining various luster and dye levels, Laura's team at Invision has produced this new collection, creating new colors with dimension, as well as reflections, taking commercial carpet to a new level! Pretty exciting, if you ask me! All three carpet lines are available in modular tile and broadloom in a rich palette of 20 colors ranging from vibrant to neutral. We are particularly excited because the Altered Elements collection uses Ultron® nylon 6,6 carpet fiber, bringing together stunning aesthetics with cutting edge fiber technology. All three lines work well together or alone for corporate, retail, or almost any environment. Ann is much more involved on the commercial carpet side of the business than I am. However, several elements caught my attention when I first read Invision's press release titled "Invision Introduces Altered Elements. 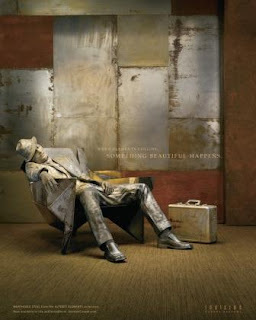 New Product Collection Proves - When Elements Collide, Something Beautiful Happens." The notion of being inspired by 'colliding elements' and the effects of the weather on surfaces definitely intrigued me. But, then, I was also impressed and curious about a product launch that seemed - from its very inception - to turn traditional processes upside down. According to the release, the collection "represents ... a new level of collaboration between top product design and technical fiber development teams from Invision and industry-leading designers Shawn Littrell and Donna Stubbs, who have worked extensively over the past two years with Invision Director of Design Laura Compton to create Altered Elements. From the base fiber materials to the dye lab, everyone was inspired to create unusual yarn constructions that allow the yarn’s varying luster and dye levels to capture the richness and texture of the weather’s effects." It seems, too, that design, manufacturing and marketing collaborated for the creation process. Very cool! Before finalizing the three carpet lines, Compton and her team reviewed a multitude of images capturing visual representations of the effects on steel, stone and slate that weather has. In my mind's eye, I can envision [or invision?] textures and colors, closeups and groupings that have the brain reinterpreting everyday elements. By the way, you may have caught sight of Broken Slate in A Foot's Perspective - Episode 9. Although these carpet styles are geared more toward the commercial end of the marketplace, we are seeing more and more of these elegant looking styles in high tech residential media rooms. Whether in a commercial or a residential setting, the Altered Elements collection definitely capture wonderful inspiration from nature, delivering a look and feel that combine contrasts in luster, dye levels, textures and yarns, and are guaranteed to both delight and soothe the soul while inspiring the mind. NOTE: While putting this article together, Laura put me in contact with Natalie Faulkner, Creative Marketing & Communications Manager for J&J / INVISION. Natalie shared with me the advertisement Invision is running for Weathered Steel [see right]. This ad pictured on the right - and the ones for Tumbled Stone and Broken Slate - are quite distinct with a definite 'Altered Elements' look to them. Natalie says that "the people in the ads are real. They were painted and dressed to blend into the elements in the background. Their emotions and overall look give each element a unique feel." Thank you, Laura and Natalie. Image originally uploaded by alphacargomagazine.wordpress.com/.../. It's that time of year again. Back to school. For carpet and kids. Children all over are loading up their backpacks with number two pencils and spiral-bound notebooks and heading back to school. They're excited about the prospect of a new experience and possibly anguished at the thought of leaving summer behind. Ah, to be in school again. But, did you know that carpet can play a role in a child's academic career? A child's success in school has to do not only with his or her academic performance but the learning environment as well. And carpet improves the learning environment. The A to Z of Building reported the following: "In many U.S. classrooms, the speech intelligibility rating is 75 percent or even less, according to the Technical Committee on Architectural Acoustics of the Acoustical Society of America. That means that listeners with normal hearing can understand only 75 percent of the words read from a list. Statistics like this are helping put acoustics in educational settings toward the top of the list for design and construction considerations. A major component of a comprehensive noise management program is the flooring." A to Z goes on to state that a study by the American Society of Interior Designers found that carpet is 10 times more efficient in reducing noise than other flooring options. Basically, because carpet reduces noise levels, children can hear and concentrate better in the classroom, improving their ability to focus and learn. A report by the Carpet and Rug Institute confirms this. It suggests that schools should include carpet in classrooms because it reduces noise, provides cushion and protection, adds warmth and comfort, and improves indoor air quality. A CRI white paper by Dr. Michael A. Berry from 2002 provides a case study involving Charles Young Hill Top Academy in the District of Columbia, an aging city school that was rehabbed, saving the school to the benefit of the students in the community. "Effective restoration is achieved through good design that addresses total environmental quality to include general sanitation, good air quality, noise control, lighting and glare reduction, soothing color, and general comfort provided by temperature and climate. The healthy school environment is kept in a steady state only with a thoughtfully organized cleaning and maintenance program." "An ability to communicate between student and teacher is possible only with good sound control at range been 58 and 65 db. At these levels normal speech can be easily heard throughout the school building. Beyond 67db, distraction occurs. This research shows that without carpet, effective sound control in open space classrooms is virtually impossible to achieve." I had no idea carpet played such a huge role in an effectively designed classroom. But carpet's benefits don't end there. Carpet can also be used as a learning tool. Check out https://learningcarpets.com/. This company manufactures carpets for all types of educational play carpets, from hop-scotch carpets to giant carpet maps. And how many kindergarten classrooms don't have a central carpet used for calendar time, counting time and the letter of the day? The next time you think carpet is just for looks, remember that it can provide significant benefits for schools as well. Related post: A Foot's Perspective - Episode 4. 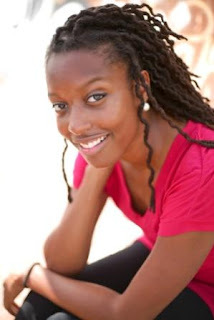 It's official.... Franchesca Ramsey [aka Chescaleigh] is the new YouTube and People.com Red Carpet Reporter! Hurray! And we met her here! Here's a recap. Elizabeth reported on the contest back in July with Be a Red Carpet Reporter! The competition, which launched in July, invited "aspiring red carpet reporters to post their videos to a co-branded casting channel on YouTube (www.youtube.com/redcarpetreporter). Applicants posted their best two-to four-minute videos showcasing their interviewing skills as they chatted up family and friends, while pretending to be on the red carpet at a Hollywood award show." And, then, we heard from Francesca who told us she had made it to the top 10 finalists! Elizabeth shared that news in Support Your Local Red Carpet Reporter! We kept our fingers crossed. And, last week Francesca shared the fantastic news with us. We promised to keep quiet until she gave us the go ahead and the details. "Franchesca Leigh Ramsey, a 24-year-old communications manager with the Miami Beach Chamber of Commerce, will spend a whirlwind two days in Los Angeles this September where she will receive the ultimate red carpet treatment herself, including hair and make-up by Revlon, a clothing allowance, VIP entry to exclusive events, before fulfilling her dream of working the red carpet interviewing television’s biggest names." Just think, “One month ago, I was surfing celebrity entertainment websites, performing stand up in front of small crowds, and dreaming of what it would be like on the red carpet.” And, now, we can look forward to her amazing Red Carpet adventure. CB: Francesca, what is most important about being a red carpet reporter? FR: For me the opportunity to showcase my personality, meet actors that have inspired me throughout my developing career and the chance to use this as a stepping stone to bigger and better make will make this the experience of a life time! CB: What do you anticipate your biggest challenge being? FR: Right now I'm focusing on learning as much as I can about the nominees and the programs they're on prior to the show. I have a confession to make, I don't have cable!! So I set up my Netflix so I can catch up on all the great shows that are nominated so I can be as prepared as possible. I also started making flash cards with the nominees photo on one side and all their info on the back. I want to make sure I have a funny anecdote or interesting fact about everyone I talk to. So I have a lot of work ahead of me, but I'm ready for the challenge! CB: What have you observed so far about the actual carpet at red carpet events? FR: Ha! Other than the fact that it's actually red, nothing really! I think I'll have to get back to you on this one, once I've actually been to a red carpet event and I can give you the inside scoop on fiber textures and such. Thank you, Francesca, and best of luck [especially with the carpet details]! We will be following your adventures on YouTube - www.youtube.com/redcarpetreporter - and can't wait to view your Red Carpet celebrity interviews. We know they will be terrific!